attempts at romance by answering him with a thoughtless jest. story with elegance and élan. When I reviewed At the Sign of the Star, Katherine Sturtevant's first novel of Restoration England, I thought nothing could possibly come close to being as good. But its sequel, A True and Faithful Narrative, is even better. Now sixteen, rebellious Meg has learned to get along with her stepmother but still hopes one day to marry a bookseller who will support her dream of becoming a writer. But when her best friend learns that what seems like a good match can end in a bad marriage, Meg has to figure out her own mind so she can choose the future (and the man) that are best suited to her. Trouble ensues when she picks up her pen to help a friend and to prove to everyone that she deserves to be taken seriously as a writer--which some people, even those she loves the most, aren't willing to accept. I'm in complete awe of author Katherine Sturtevant's talent. This novel's plot is unique, its characters are fascinatingly alive, and once again, every carefully selected word makes an impact. And Meg's struggles to get her book written show an unparalleled insight into the writer's craft. 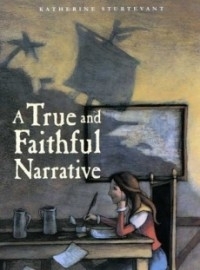 A True and Faithful Narrative is a gift to readers, especially those who, like our heroine, dream of becoming writers. Luckily for us, brilliant authors like Sturtevant have already shown the world the talent that women can possess.